The pressure in a system is automatically calculated by Design Master. The pressure drop is calculated based upon the CFM in the ducts, the duct shape and lengths, and the particular fittings used in the duct section. The critical path can be highlighted on your drawing. You can then adjust your design to reduce the pressure drop if necessary. A report list all of the pressure numbers for the critical path can be generated. 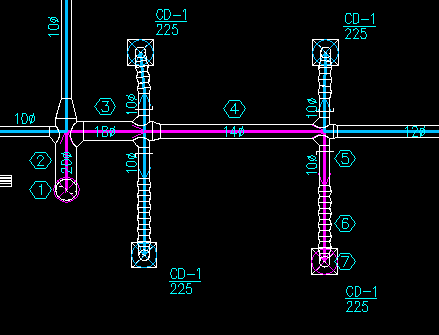 An ID tag links the ducts on the drawing with the rows on the report. The pressure numbers for the first section of ductwork can be used to size the fan for your HVAC systems.